The concept seems relatively innocuous. Get a burst of energy by drinking something out of a colorful can that looks an awful lot like a soda. But energy drinks have a lot more going on under that pop top. Here’s a look at some of the potentially harmful ingredients and some of the health problems that can result if you drink too many of the beverages that promise a buzz. – Caffeine boosts energy but too much can cause rapid heartbeat and and high blood pressure. – High amount of sugar could cause obesity, dental issues and type 2 diabetes in the long run. – Drinking just one 16-ounce energy drink can increase blood pressure and stress hormone levels. – Frequent consumption over an extended period of time has been linked with liver injury. 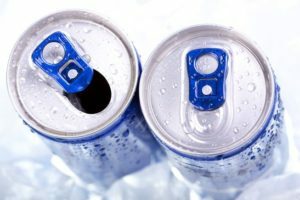 – Taurine may help boost athletic performance and, when combined with caffeine can increase mental ability but the combination may also cause issues with the heart. 1. Under what circumstances do you take energy drink? 2. Which side effects of taking energy drink are you aware of? Have you had any experience? 3. With these known side effects, are there restrictions or regulations regarding the consumption of energy drinks? If now, do you think there should be one? 4. What would you recommend as healthier alternative/s to energy drink?